Christopher Dwightstone Jones (born July 12, 1990) is an American football defensive end for the San Francisco 49ers of the National Football League (NFL). He was selected in the sixth round of the 2013 NFL draft by the Houston Texans. 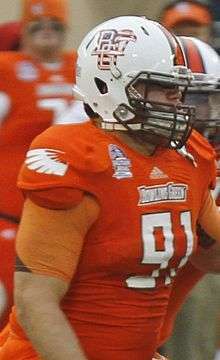 He played college football for Bowling Green State University. He has also been a member of the Tampa Bay Buccaneers, New England Patriots and Miami Dolphins. Vertical jump and broad jump values are from the Bowling Green Pro Day; all other values are from the NFL Scouting Combine. Jones was selected by the Houston Texans in the sixth round (198th overall) of the 2013 NFL Draft. He was released by the Houston Texans on August 31, 2013. Jones was claimed by the Tampa Bay Buccaneers after his release from the Houston Texans on September 1, 2013 and was inactive for the Tampa Bay’s season opener against the New York Jets. He was released by the Buccaneers on September 10, 2013. After the Buccaneers waived Jones, the New England Patriots claimed him off waivers. Jones recorded his first career sack against the Cincinnati Bengals on October 6, 2013. On October 20, during overtime of the Patriots' Week 7 game against the New York Jets, Jones was called for a 15-yard unsportsmanlike conduct call on a Nick Folk missed 56-yard field goal that would have given the Patriots the ball around midfield. The call was for violating a rule, altered that season, prohibiting pushing a teammate into the opponent's formation (it was the first time that call had been made). Folk went on to hit a 42-yard field goal that gave the Jets the win, in a game where Jones also recorded two sacks. Jones finished the season with 6.0 sacks, which was 2nd amongst rookies. Against the NY Jets Jones blocked Nick Folk's attempted field goal, securing the victory for the Patriots. The feat also earned him AFC Special Teams Player of the Week honors for Week 7 of the 2014 NFL season. He finished the season with three sacks and 15 tackles. Jones and the Patriots won Super Bowl XLIX over the defending champion Seattle Seahawks, Jones allegedly played the game with a torn calf. Jones calf injury caused him to miss the entire 2015 NFL season. The Patriots waived Jones on April 15, 2016. On April 18, 2016, Jones was claimed off waivers by the Miami Dolphins. He was released by the Dolphins as part of final roster cuts but re-signed with the team on September 14, 2016. He played in seven games, starting none, with no sacks and four tackles. He was released by the Dolphins on November 7, 2016. Jones was claimed off waivers by the 49ers on November 8, 2016. He was made starter against the Dolphins on November 27, 2016. Jones married his wife Angela on New Year's Day, 2014. The ceremony was held on the 50-yard-line on the field of Gillette Stadium. The couple has two sons, Maverick and Cavanaugh. ↑ "Chris Jones". bgsufalcons.com. Retrieved February 13, 2013. ↑ "Chris Jones". NFL Draft Scout. Retrieved July 22, 2013. ↑ "Chris Jones: Combine player profile". NFL. Retrieved July 22, 2013. ↑ Daley, Matt (April 27, 2013). "BGSU's Chris Jones Selected By Houston". Hustle Belt. Retrieved April 28, 2013. ↑ "Patriots claim DT Chris Jones off waivers from Tampa Bay; Released OL Josh Kline". ↑ "Jets stun Patriots on Nick Folk's controversial FG in overtime". Associated Press. 20 October 2013. Retrieved 20 October 2013. ↑ "Patriots release DL Chris Jones and DL Ishmaa'ily Kitchen". Patriots.com. April 15, 2016. Retrieved April 15, 2016. ↑ Dragon, Tyler (April 18, 2016). "Miami Dolphins claim DT Chris Jones off waivers". NFL.com. Retrieved April 18, 2016. ↑ "Dolphins re-sign DT Chris Jones, waive QB Brandon Doughty". ↑ "Dolphins Make Roster Moves". MiamiDolphins.com. November 7, 2016. ↑ "49ers Place Arik Armstead on Injured Reserve, Claim DT Chris Jones". 49ers.com. November 8, 2016. ↑ "Brownsburg's Chris Jones fills gap for Patriots". Indianapolis Star. Retrieved 2015-11-15.